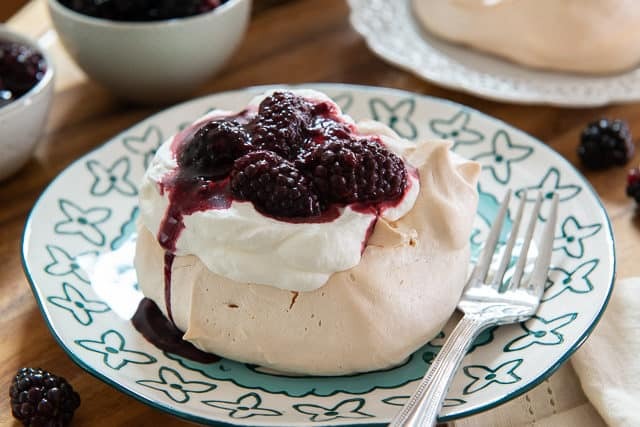 This Pavlova with Blackberry Compote is one of my favorite desserts to serve for company, because it’s really easy to make, and yet so impressive to guests! Few desserts are as heavenly as pavlova, and it’s so fun to make it for people who’ve never had it before because they’re always blown away. Named after Russian ballerina Anna Pavlova, it’s a three-part dessert with a meringue base, cream, and a fruit component. If you’ve never had it before, the inside tastes kind of like a soft and light angel food cake with a crisp marshmallowy meringue edge. It is the definition of melt-in-your-mouth delicious and it takes well to many different variations of flavor and fruit. Because the meringue is so sweet, I like to prepare a blackberry compote for the top, adding a bit of lemon to give it more tangy flavor. Making the compote is very simple, but you can always top the pavlova with chopped fruit if you prefer. Also, all the pavlova components can be made ahead of time, which comes in handy for dinner parties. I’ll discuss this more below. Dollop the meringue onto a parchment-lined baking sheet, in as many or as little portions as you’d like. 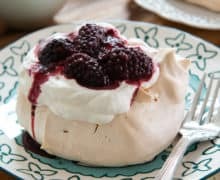 As noted in the instructions in the recipe box, try your best to let the pavlovas cool as slowly as possible, to prevent sinking and cracking. But, if they do crack, don’t sweat it! The tops will be filled with chantilly cream and blackberry compote, so imperfections are easy to hide. This particular batch, I had an overexcited toddler open my oven and they fell slightly. But when I served them to my visiting family, they didn’t even notice because of the cream and berries. 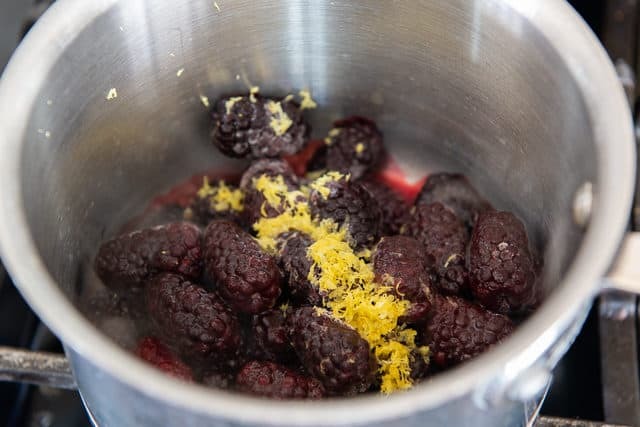 I love making a tangy compote for my fruit component, and the tart nature and color of blackberries make them my first choice. However, you could also do fresh macerated fruit if you prefer, and try other types of berries, like strawberries or raspberries. I intentionally don’t add any sugar to the compote, as the meringue is tremendously sweet and is best balanced by a more sour fruit topping. If you find it too tart, you can simply add sugar to taste while it’s still hot, making sure the sugar granules dissolve before pulling it completely off the stove. 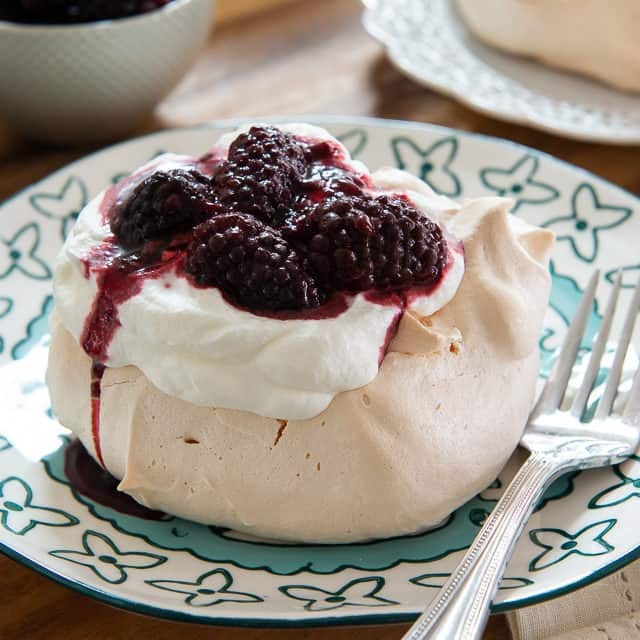 Once assembled, the pavlovas should be eaten right away, but know that you can make all three components in advance. Pavlova meringues can be made ahead of time and held at room temperature or in the freezer. 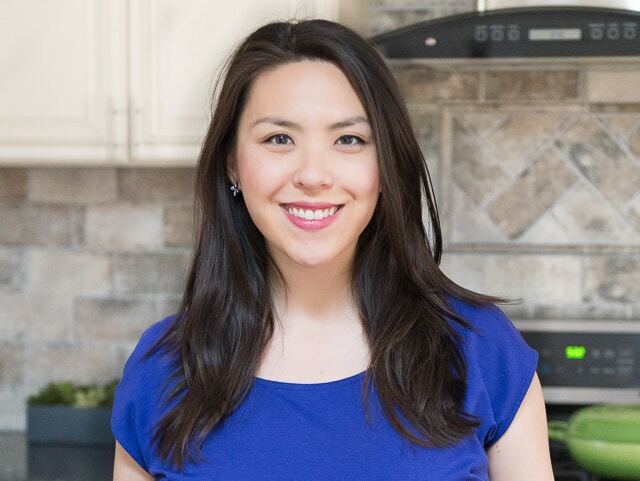 Room temperature: Let cool completely, then store in an airtight container for up to 2 days. In this case, it’s extremely handy to have a baking sheet with a lid (affiliate), so you don’t have to move the pavlovas around and risk breaking. Freezer: First note that you have to be very careful with freezing since the meringues are delicate, and they can break while handling them or if they get jostled around in the freezer. But you can freeze them up to two weeks in advance. All you have to do is thaw them at room temperature for a few hours before serving. Chantilly Cream: Ideally make this a few hours before serving, but no more than 1 day in advance. 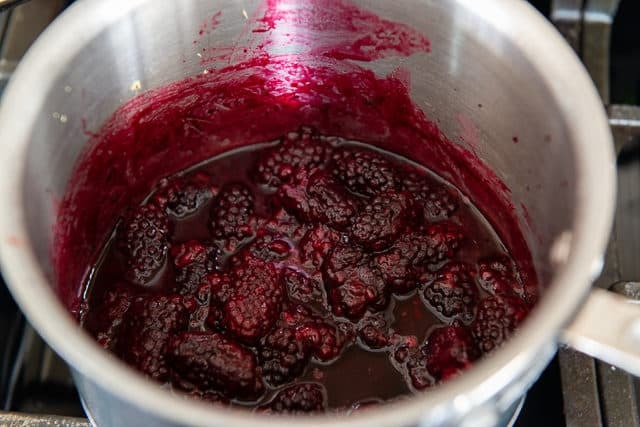 Blackberry Compote: Can be made two days in advance. 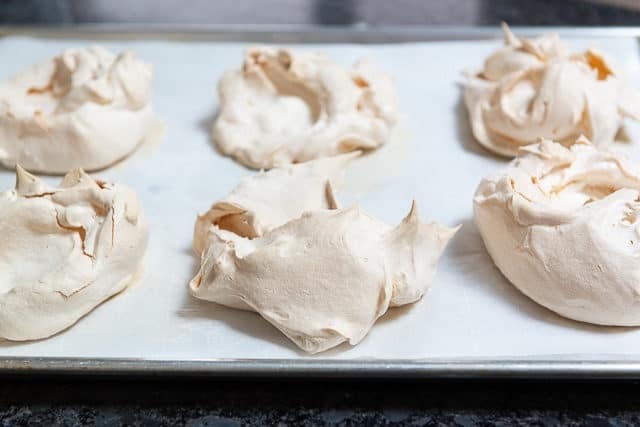 Just one word of warning: Like any kind of meringue, I don’t recommend making pavlova on a rainy or humid day, as the pavlovas can lose their crispiness quickly and get gummy. Baklava and Peanut Butter Pie are two of my other knock-their-socks-off desserts that are completely make-ahead. See more ideas in my dessert section. Enjoy! Can Pavlova be frozen? Yes, I’ve done it for the meringue base, but know that it’s extremely easy for the pavlova to break because it’s so delicate. Be careful in handling. Let the pavlova thaw at room temperature for a few hours before assembling. Is Pavlova Gluten-free? Yes, and it can be made dairy-free by serving with a coconut cream instead. This Pavlova with Blackberry Compote is an impressive dessert that's perfect for special occasions or dinner parties. 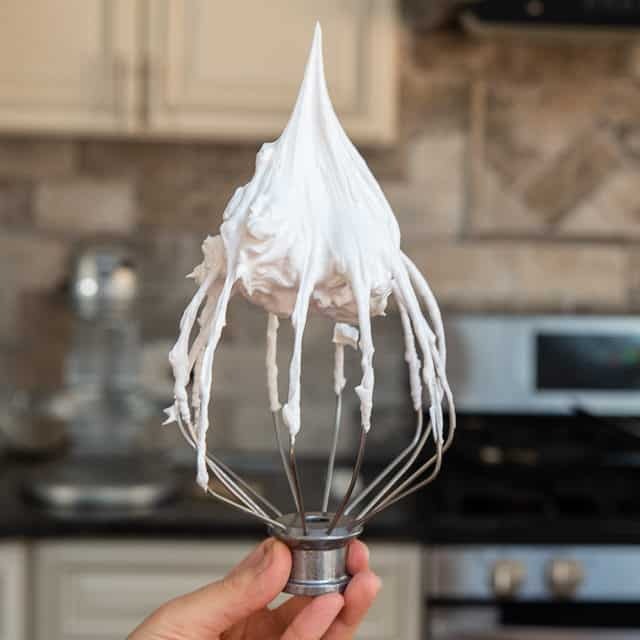 In a stand mixer fitted with the whisk attachment, whip the egg whites, cream of tartar, and salt on medium high speed for 60 seconds, until foamy. 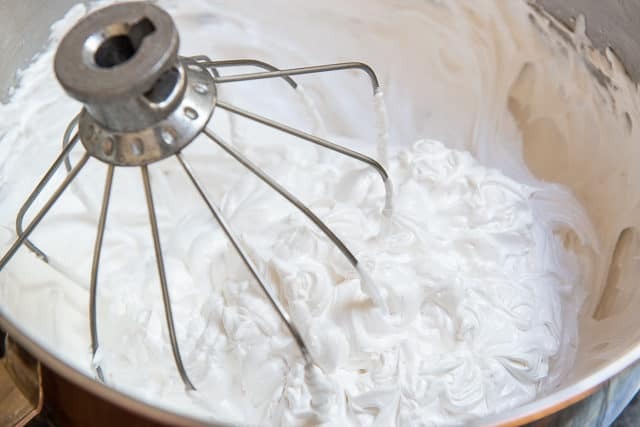 Add the sugar, cornstarch, vinegar, and vanilla and continue whipping on high speed for 2-3 minutes, to stiff peaks. Dollop the meringue onto the parchment paper in 6 individual mounds. Carefully shape them with a spoon, making sure they’re not more than 1.5 inches tall. Bake in the middle of the oven for 10 minutes, then turn the heat down to 300 degrees. Continue baking for another 40 minutes. Over this time, your meringue will puff up, take on a lightly browned color, and crack slightly. Turn the oven off, and prop your oven door open slightly so your pavlova can cool very gradually. Leave it in the oven with the door propped for at least 30 minutes. 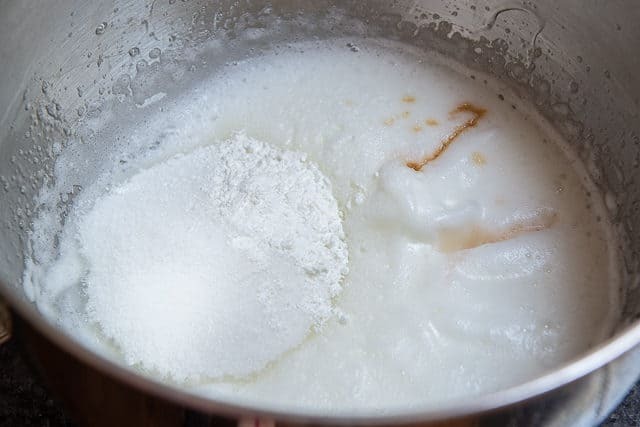 Pour the heavy cream into a bowl, and whip with a hand or stand mixer for about 30 seconds until it thickens slightly. Add the sugar and vanilla extract, and continue mixing until you get soft peaks. Combine all ingredients in a saucepan, and cook on medium heat for 8-10 minutes, until the blackberries soften and release their liquid. 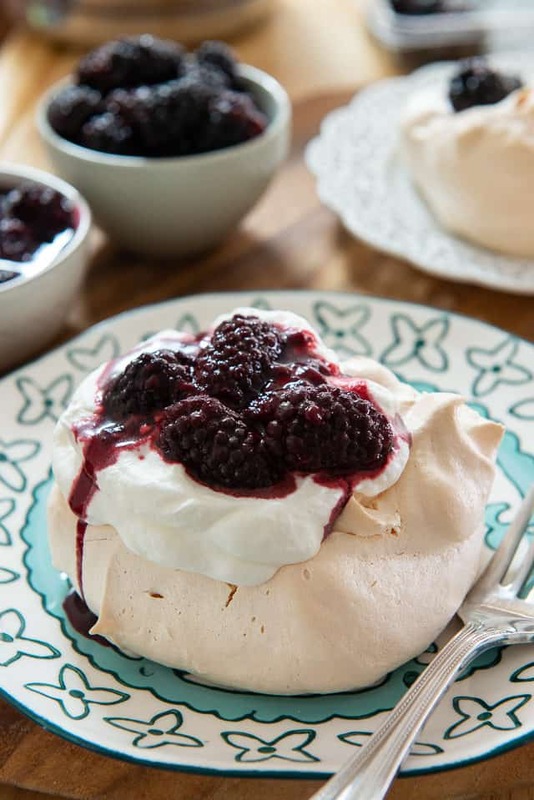 Place a meringue on an individual serving plate, then add a few spoonfuls of Chantilly cream, followed by a few spoonfuls of blackberry compote. Serve promptly, and enjoy! 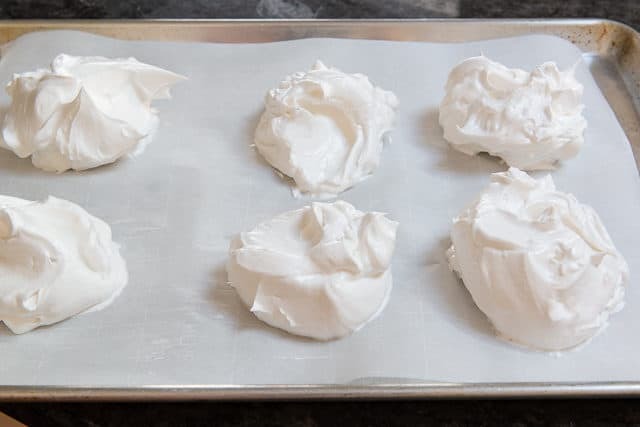 As with any meringue, make sure your bowl and whipping utensils are spotlessly clean, and take care not to get a single drop of egg yolk mixed with the egg whites. 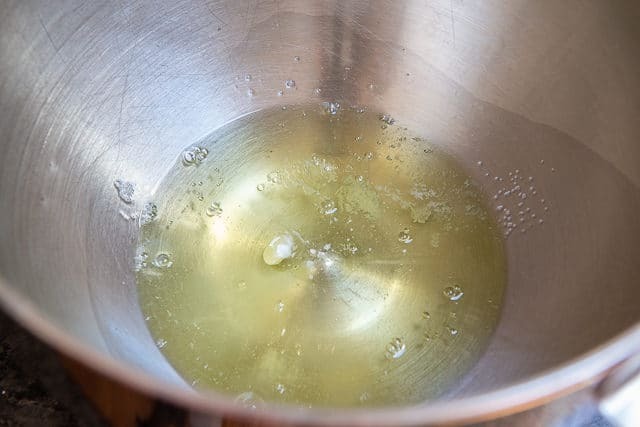 Any small speck of dirt, drop of oil, or fat (from the egg yolks) may prevent the egg whites from whipping up. Post updated in March 2019. Originally published January 2011. I love lemon meringue pie… can I substitute a lemony compote instead of berry?